The 6600 family of line matrix printers support multiple data streams: IPDS (Intelligent Printer Data Stream), Twinax/Coax SCS and ASCII. Users can choose from a variety of models and configurations to meet system and user requirements and applications. If system requirements change, users can select from an extensive array of options to support expanded requirements. The 6600 series has the flexibility and forms handling capability to support mulit-part forms, financial reports, invoices, payroll information and program listings. The quiet operation of the fully enclosed models and the flexibility of the pedestal models allow users to match printers to the environment. Decision Data's 6600 printers offer AS/400 and RS/6000 users true IBM supported ASCII, SCS or IPDS emulation that can be easily installed on IBM Systems as replacements for existing products or new printer requirements without concern. The addition of the optional QMS or IGP graphics features enable expanded print functions such as bar codes, forms overlays, and expanded characters to enhance printed output. PrintNetAvailable as an option on ASCII versions of the Decision Data 6600 line matrix printers, PrintNet is an internal network interface which acts as a print server and allows the printer to be shared with users on the network. PrintNet is an Ethernet LAN solution that actually provides the printer with its own IP (Internet Home Page) address. Using an ordinary web browser, the network administrator can access the printer remotely to change settings, monitor status such as online/offline condition, paper out, print queue jobs, and change configuration. 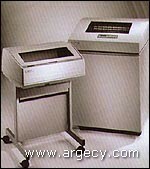 Hot Port SwitchingAuto-Port switching is standard on all Decision Data 66xx series line matrix printers. It allows the printer to automatically accept and print jobs from one, two, or three input ports without requiring manual intervention. To activate this automatic operation, the operator simply choose the AutoPort Switching mode at the printer's control panel. All dba measurements are ISO 7772 compliant.